Ose Arheghan is a nationally recognized LGBTQ youth advocate. They work to ensure the rights of queer people of color and individuals with other marginalized identities. Last year, they served as GLSEN’s National Student Advocate of the year for their activism both through journalism and political advocacy. 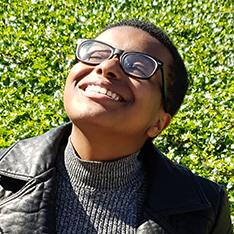 Arheghan is currently working towards a dual degree in Political Science and Sexuality Studies at The Ohio State University as a Morrill Scholar. Morrill Scholars are brought to the university to promote diversity and inclusion through organizing and advocacy. They are also currently serving their second term as a Student Organizer with Advocates for Youth, a DC based sexual health and reproductive justice nonprofit that empowers youth to make change in their own communities. They have been featured in The Root, NBC, MTV News, and various other new outlets for their advocacy and activism in the past year. Arheghan also worked to better the lives of African-American students in Cleveland by co-founding the first high school junior youth council chapter of the NAACP that Northeast Ohio has seen.